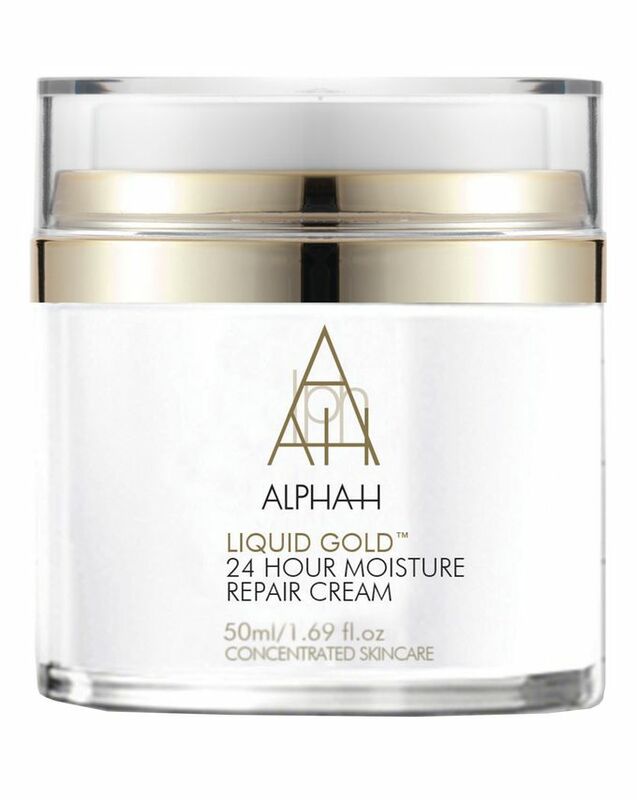 With pioneering new technology, Alpha-H’s Liquid Gold 24 Hour Moisture Repair Cream feels incredibly indulgent when dispensed, but turns into a featherweight serum when massaged into skin; absorbing almost instantly to provide weightless hydration and recapture lost radiance. 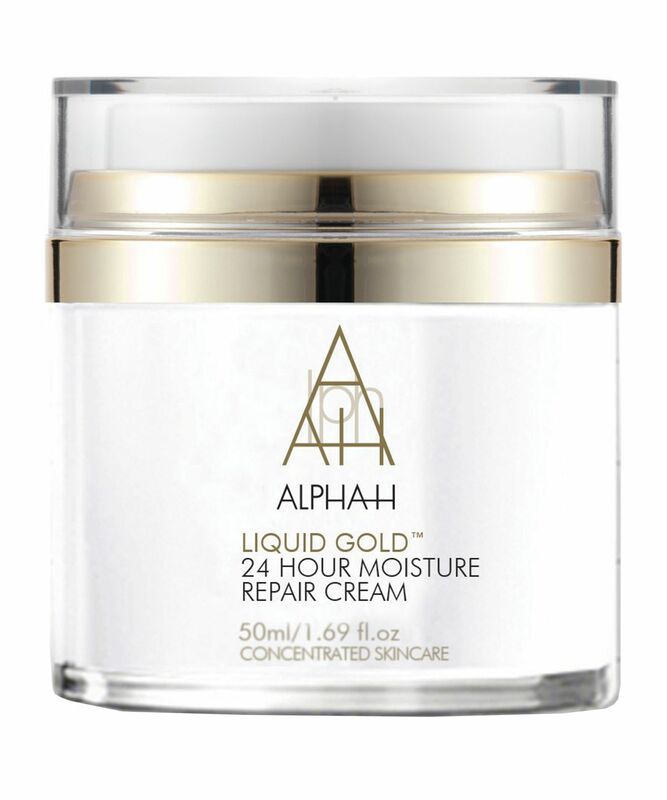 With chia seed technology – alongside hyaluronic acid – to ‘expand’ within the skin and plump up lines within minutes, this also contains 24ct gold flakes to bestow an ethereal golden glow. 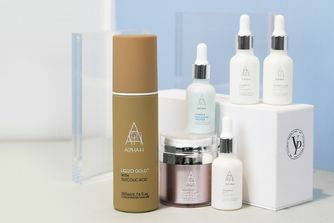 Lactic and glycolic acids then dissolve the ‘glue’ that binds dead cells to skin’s surface, while argan stem cells help to kick-start cellular regeneration – repairing and re-densifying 'thin', depleted skin that's lost its bounce. Using glycolic acid in the daytime can increase sun-sensitivity. If you're apply this in the morning, allow to absorb before following with sunscreen to protect from UV and pollution. Aqua, Glycerin, Caprylic/Capric Triglyceride, Squalane, Glycolic Acid, Dimethicone, Glyceryl Stearate, Cetearyl Alcohol, Hydrogenated Polydecene, Peg-100 Stearate, Polyacrylate-13, Ceteareth-20, Sodium Pca, Albizia Julibrissin Bark Extract, Carbomer, Polyisobutene, Phenoxyethanol, Potassium Hydroxide, Camellia Sinensis Leaf Extract, Lactic Acid, Olea Europaea Leaf Extract, Persea Gratissima Oil, Tocopheryl Acetate, Vitis Vinifera Seed Oil, Salvia Hispanica Seed Extract, Isomalt, Gluconolactone, Caprylyl Glycol, Allantoin, Wheat Amino Acids, Polysorbate 20, Sodium Hyaluronate, Sodium Benzoate, Panthenol, Hydroxypropyl Cyclodextrin, Aloe Barbadensis Leaf, Hydroxyproline, Lactobacillus Ferment, Gold, Argania Spinosa Sprout Cell Extract, Lecithin, Palmitoyl Tripeptide-38, Linalool. The product has improved the condition of my skin. I use it as a night creme daily. My skin has not been that flawless in quite a while. Brilliant moisturiser, although it can sting after using an exfoliating scrub. Has really helped my acne to clear up. I have incredibly sensitive facial skin, with hormonal acne and scars. When I first used this I was disappointed but after going through my entire sample sized tube I have noticed a drastic difference in my skin, it looks radiant and smooth when I wake up in the morning. I use this alongside the Mario Badescu silver powder and whitening mask and I honestly won’t use anything else in the foreseeable future!!! I got a 15ml sample of this product and was really looking forward to using it. Unfortunately, it irritated my skin. First I wasn't sure it was from this product so I gave it a few more chances but now it's for sure I got redness and irritated skin from this product. My skin is not particularly sensitive so it was quite a surprise. The texture is rich and feels rather greasy to me. I will definitely buy this again. 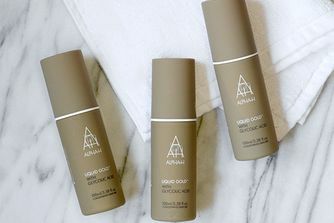 When I wake up, my skin looks refreshed, radiant and supple. This is, most certainly, not my usual look in the mornings. It's down to this cream and the Liquid Gold Rose toner. I would not recommend this for day use, however. The ingredients leave the skin more vulnerable to the sun. My skin feels amazing second after putting the product on. Love it. 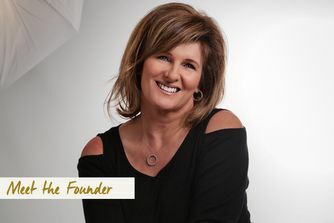 Like most of us here I love trying different skin care products and brands. Usually, the difference a cream makes to your skin kind of creeps up on you after a couple of weeks or months, and that is why I'm a bit shaken. Because after the first use I looked in the mirror when I woke up and was amazed! Just wow, I'm stunned that a cream can actually change your skin so very fast, with fine lines and not so fine lines looking almost plumped out of existence. Never going to be without this, I LOVE IT! Love the brand but this one is my favourite. Very rich and works wonders. I use it at night time is my savier for my skin when my skin is damaged this helps it so much. I am on a second jar of the cream. Skin feels very plump and like the cream is really working & doing something on your skin! It didn't go well with any of my serums and it piled even on its own. Hated the scent. But in the mornings my skin looked brighter.